As a franchisor or franchisee, you have a strong brand to work with. Brand strength is part of what makes franchises work so well. Divvy’s customized web portal gives you the tools you need to efficiently and effectively maintain your brand image by providing marketing collateral. Franchisors work directly with Divvy, so you gain back valuable time in running your business. Whether you need brochures, fliers, business cards or any other brand related materials, Divvy is here to make your job easy. By using Divvy, you get a customized web portal built specifically for your business. We’ll build the site, so that franchisees can log in and order all their collateral materials through a quality controlled site. 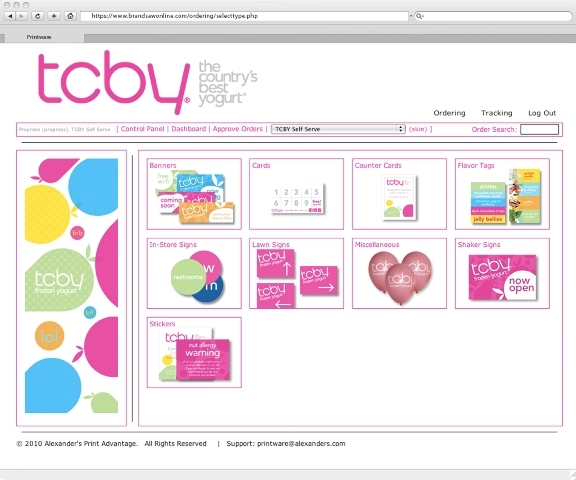 Your Divvy website will consist of all marketing collateral materials your franchises need, set up with easy to use pages for ordering. All the franchisee has to do is fill their online shopping cart with necessary materials, place their order and we’ll get the orders quickly printed and delivered right to the franchisee. We also have a tracking service that allows the franchisee to check where their materials are, and when they’ll arrive at their franchise. All collateral materials ordered through the online portal are fulfilled through Alexander’s print shop, where we print and fulfill orders 24 hours a day, 7 days a week. Make things easy by streamlining all your marketing collateral materials through Divvy’s online portal.